The constitution bench of the Supreme Court heard seven petitions filed by Muslim women challenging the 1,400-year-old practice of triple talaq, including by one who was divorced on WhatsApp. The triple talaq verdict was delivered by a panel of five judges from different major faiths. The Supreme Court today declared in a majority judgement that the Muslim practice of triple talaq or instant divorce by uttering "talaq (divorce)" three times "illegal and sinful". Triple talaq"is not integral to religious practice and violates constitutional morality", said the court. 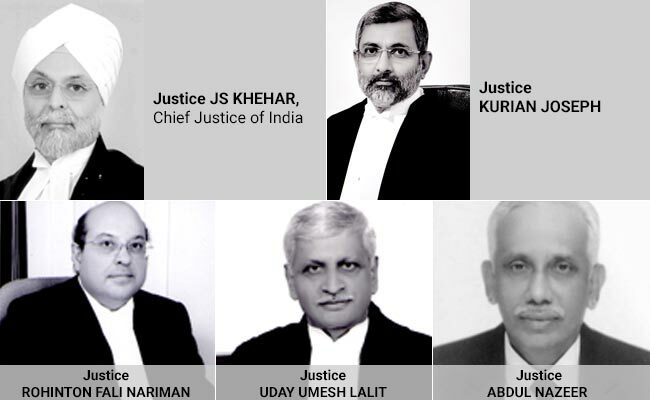 The five judges, including Chief Justice JS Khehar, are from major faiths in India -- Hinduism, Christianity, Islam, Sikhism and Zoroastrianism. Three of them, Justices Kurian Joseph, Justice Rohington Nariman and UU Lalit, said "what is sinful under religion cannot be valid under law." They asserted that "triple talaq may be a permissible practice but it retrograde and unworthy. Since triple talaq is instant it is irrevocable and the marital tie gets broken, it violates the right to equality." Justice Kurien Joseph said: "What is held bad in the Holy Quran cannot be good in Shariat and, in that sense, what is bad in theology is bad in law as well." Chief Justice JS Khehar and Justice Abdul Nazeer differed and said while triple talaq "may be sinful", the court can't interfere in personal laws which have the status of fundamental right under the constitution. They were of the view that parliament should bring a law to end the practice. "There cannot be any Constitutional protection to such a practice," said Justice Joseph, disagreeing with the Chief Justice. Muslims are governed by the personal law that came into force in 1937. The government has long argued that practices such as triple talaq violate fundamental rights of women. The Muslim Personal Law Board had opposed any court intervention, arguing that the court must keep out of matters of faith. The Centre told the Supreme Court that the practices like 'triple talaq' impact the social status and dignity of Muslim women and deny them fundamental rights guaranteed by the Constitution. Justice Nariman and Justice Lalit said: "Divorce breaks the marital tie fundamental to family life in Islam. Not only does it disrupt the marital tie between man and woman, but it has severe psychological and other repercussions on the children from such marriage."